Do you use a wheelchair, a movement facilitating devices or suffer from an illness which may impede your access to a beach? Don't worry. 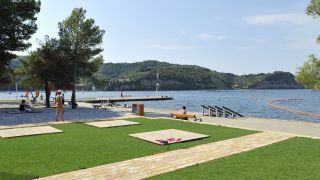 We have prepared for you a list of accessible beaches so you too can enjoy the sea and the sun in a relaxing environment. The best beaches which are also easily accessible to everyone. 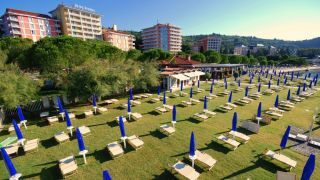 Meduza, the unique beach of LifeClass Hotels Portorož, is one of the most exclusive beaches in the Adriatic. 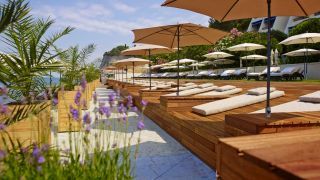 Introducing the Perfect Summer Club program on the beach of the Grand Hotel Bernardin. Located among pine trees, surrounded with Mediterranean vegetation, where 12 energy points. In hot summer day, we invite you to come to a verified ecologically sound beach. This beach partly consists of pebbles and the other part is made of concrete. Entry points are also handicapped-people-friendly.